Once the capital of Roman Asia, Ephesus is the best-preserved Greco-Roman classical city. 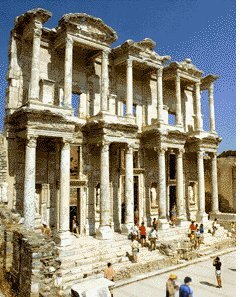 _ _www.helloTURKEY.net' s mission is to give you as much detailed assistance before you visit Kusadasi and Ephesus. The magnificent ruins of Ephesus, one of the greatest cities of antiquity and the Roman capital of Asia is located 75km(~47 mi) south of Turkish largest port city of IZMIR, on Aegean Sea ('Ege Denizi' in Turkish). Nearest Turkish towns to the Ephesus are SELCUK (3mi / ~ 5km) and KUSADASI (5mi / ~ 8km). Ephesus was founded by colonist from Athens in early 1000 B.C., this mean 3 thousand years ago, as a port on the Aegean Sea, the ruin city now lies several miles inland, and the original harbor looks out over a dry valley, with not a drop of water in sight. The city became famous for its TEMPLE OF ARTEMIS, dedicated to the Greek goddess ARTEMIS and considered one of the 'Seven Wonder of the Ancient World'. Ephesus represents so many different facets of Ancient Greek and Roman cultures. This ancient city diagonally insert itself between the mount of Coressos(in Turkish: BÃ¼lbÃ¼ldag) and mount of Pion(in Turkish: Panayirdagi) in very near to town of SELÃUK, in province of Izmir. or in any other city in TURKEY ? During its Golden Age (2nd century A.D.) , the city had a population of around 300,000. It monopolized the wealth of the Middle East and was one of the principal ports of the Mediterranean. 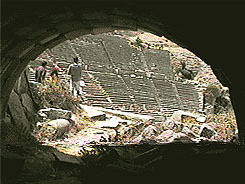 As a commercial and financial power, Ephesus was also a center of cultural activities. During Hellenistic times, Ephesus was ruled by 'The Seleucids. After 190 B.C. it became part of the 'Pergamon Kingdom' and together with that kingdom became a Roman dependency(133 B.C.). City experienced its brightest period of development during emperor Augustus and became capital of roman province of Asia Minor and thus where the Roman proconsul resided. 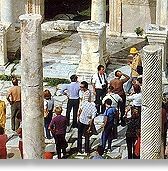 Ephesus had a great importance during Christian times by the facts that St. Paul visited the city after 50 A.D. and also St.John was buried at the beginning of the 2nd century. City was destroyed during 7th and 8th centuries. The continued silting up of its harbor caused a steady attrition to the city's commercial life. During Byzantine time, in 1304 the SELJUCKS captured the area and at the beginning of the 15th century the role of the OTTOMAN TURKS finally established and area named 'SELCUK' today. The Seljuk Turks also built the last monument in Ephesus, the ISA BEY MOSQUE marking the ancient city' transition to Islam. Ephesus adorned with splendid of monuments, theatres, temples, agoras, gymnasiums, libraries, which it shows here in big picture on the left above. The protectors of the was ARTEMIS, the goggles, whose temple is considered one of the Seven Wonders Of The World. 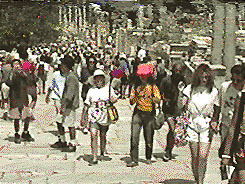 Ephesus is one of the most important city of antiquity and the visit to Ephesus, is one of the highlights of any visit of yours to Turkey (TÃ¼rkiye). When you visit to Ephesus, from the entrance the first point of interest is THE ODEON a small amphitheater for about 1500 people built into the hillside and almost perfectly preserved. This theater built around 200 AD it saw the performances of plays and concerts. Theatre actually has been beautifully restored and still used from time to time for artistic and folkloric shows. This theater has been host for many famous performers such as Elton John. Theater also serve every year in May during 'The festival of Ephesus' ( EFES FESTIVALI ). 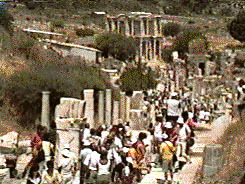 This magnificent archeological site of Ephesus is only for pedestrian visitors. 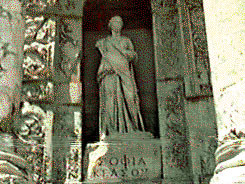 The marble streets, Greek and roman monuments statuary and the immense size. There is over 1.3 mile(2km) walking path over flat and uneven surfaces. 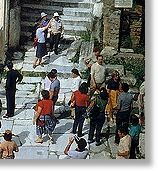 When you visit Ephesus please consider waring your comfortable walking shoes. We hope you'll stay at least two days in the area to be able to see all the sights at this extraordinary ancient city. Ephesus is consider to be one of the seven wonders of the ancient world and be sure to make plans far enough in advance to allow a few days stopover. Most tourists visit Ephesus by taking a ferry tour which covers Greek islands in the Aegean Sea as well as mainland Greece. Often this also includes Kusadasi and Ephesus. However, the stop they make at Ephesus is only a few hours and I feel sure you will want to spend more time here. Tour ferries arrive in Kusadasi in morning hours and take off right before dinner time, so weigh carefully the advantages and disadvantages of tours. the disadvantages are that you miss so much by not taking the time to stay a little longer. If you prefer the ease of a tour, at least consider the possibility of allowing enough vacation time to come back on your own to see the places where the tour did not take you. There are so many beautiful places to see that a stopover of only a few hours just does not do it justice. We suggest you arrange your trip individually or make a selection with a Turkish tour company which will give you the opportunity of staying longer in order to see this beautiful area.